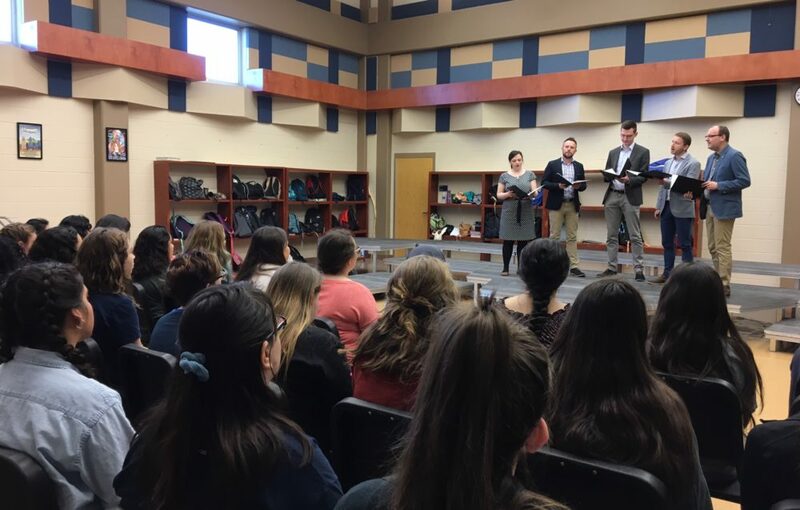 On April 24, 2017 the amazing vocal group Calmus Ensemble from Leipzig, gave a beautiful private performance for 40 lucky choral students at Madison High School. The group sang a quite different program at Madison than the program on our formal series at Temple BethEl. Their program included a work by Bach, an intricate and complex fugue, a work by Queen (the rock group), and a very humorous ditty that included some comedy material involving a triangle played by two people. The students rose to their feet in a spontaneous ovation at the end of the concert. This was our last Outreach Event for the 2017-18 season. SACMS is pleased to be able to offer these Outreach Events as a musical gift to our community. If you support this concept, please consider making a donation to the Ed Mandel Fund to further these educational concerts.